This single chip DLP Optoma projector is a great home entertainment projector that you can use in darkness as well as daylight, and it will produce superb image quality. Ideally, the Optoma HD25-LV can be used in most living rooms, family rooms, and more. Yes, there are projectors that are even brighter, but this one needs to be considered a “light canon”. Once calibrated, and with Brilliant Color enabled, it is nearly twice as bright as majority of home theater projectors once they’re calibrated. Yet, if you are about turning the projector on and enjoying it, this model is one of the better under $1000 projectors on the market if you require a goodly amount of brightness. Don’t confuse this model with the standard Optoma HD25 projector. These two projectors are similar in some ways, but there is a pretty big difference in both power and price. This model is rated over 50 percent brighter, and is slightly pricier than the HD25. The HD25-LV is your family room, or your living room projector boasting the brightness to tackle those rooms. This projector would probably be a very good choice particularly for those first-time projector owners, especially the ones that only want the “big screen”, and do not want to be fiddling around with the settings on their projector once set up. This model might be a hard sell for people who like to play around with projector’s settings. 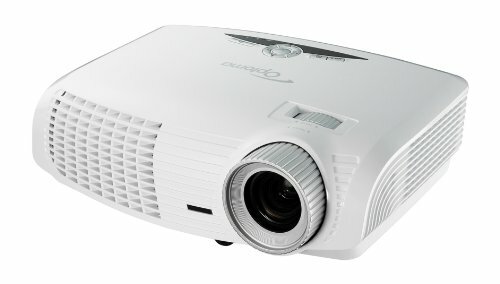 So, if you are looking to get a premiere quality projector, this one is best suited for you. Bright mode on this projector measures around 2420 lumens which is more than double the maximum of earlier mentioned Optoma HD25 projector. At a glance, it can be pretty difficult to tell these two projectors apart since they have the same body design. However, when you start the projector up, the difference is obvious. The Optoma HD25-LV is obviously much brighter projector. Its Cinema mode measures over 2300 lumens, and with that amount of light output, an 80-inch diagonal image in your living room looks well-saturated, high in contrast, and brilliant despite the presence of ambient light. Black level always suffers when there’s ambient light in the room, but this happens with any projector, yet high light output keeps the projected image from appearing dull or flat, and preserves dynamic range. This projector features a manual 1.2x zoom and no lens shift. As such, the easiest and simplest placement choice is on a table. This would be a great choice if you intend to make use of the projector’s portability, as it’s much more difficult and complicated to mount and dismount it from the ceiling.